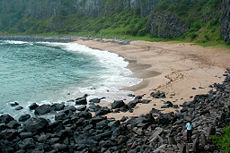 One of Jeju's beautiful beaches. 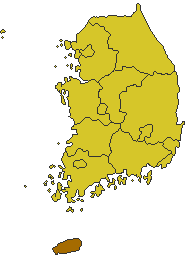 Map of South Korea showing Jeju-do to the south. Jeju-do (transliterated Korean for Jeju Province, short form of Jeju Special Self-Governing Province) is the only self-governing province in South Korea; situated on and coterminous with the country's largest island, Jejudo, and its capital is the city of Jeju. It is romantically labeled the island of triple abundance: Wind, stones, and women—and its reputation as an island paradise is further enhanced by three things the island does not have—beggars, thieves, or locked gates. For most of the island's history, Jeju-do had little contact with the Kingdoms of Korea, and the culture of Jeju-do developed in isolation from the rest of Korea. In the Joseon period, this changed, when Joseon monarchs used Jeju-do as a place to send political scholars who were banished from the capital for their dissident teachings. 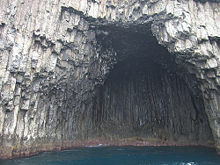 Jejudo has a UNESCO Natural World Heritage Site: Jeju Volcanic Island and Lava Tubes. Jeju-do lies at the confluence of the Korea Strait, the Yellow Sea, and the South China Sea, about midway among China, Japan and the Korean mainland. Jeju City is at Latitude 33° 20' N., Longitude 126° 30' E.
In Korean, do is the phonetic transcription of two separate hanja (Chinese characters), one meaning "island" (島) and the other "province" (道). Jejudo (Romanized, officially, without the hyphen) refer to Jeju the island, not the province, while (with the hyphen) Jeju-do refers to the government administrative unit. (No other island is a Korean province, creating this potential confusion.) The table below also includes the name of Jeju City, the provincial capital. Before 2000, when the Seoul government changed the official Romanization of Han-geul, Jeju was spelled Cheju. Almost all prior written references to the island use that spelling. Before 1945, Europeans called the island Quelpart, which apparently came from a corruption of the Korean word for "orange grove," gyul-bat: Explorers pointed to the groves, asking for the name of the island, and mistakenly interpreted that term. 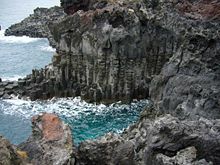 Lava cliffs on the Jeju coast. Jeju Island is a volcanic island, dominated at its center by Hallasan, an extinct volcano 1,950 meters high and the highest mountain in South Korea. The remainder of the island is formed by about 360 smaller "Orum" cones surrounding the Hallasan volcano. The basalt-and-lava island was formed entirely from volcanic eruptions two million to one million years ago, with minor volcanic activity since until the most recent eruption around 8,000 B.C.E. Jeju-do's location in the ocean, south of the mainland of Korea gives is a subtropical climate, warmer than the rest of Korea, with an annual mean temperature of about 16°C, and four distinct seasons. Half of the summer is rainy, and the winter is fairly dry. Samseonghyeol, where Jeju's three mythical founders were born. According to the founding myth of Samseonghyeol, the Jeju people originated with three divine men who emerged from holes in the ground at Moheunghyeol, at the northern foot of Hallasan. Each shot an arrow in a different direction; they settled and married where their arrows lit. Jeju was the independent country Tamna until it became a protectorate of Silla in 662 C.E. In 938, after the fall of Silla, Tamna became a protectorate of Goryeo. In 1105, Tamna lost autonomy and became a Goryeo province. King Uijong of Goryeo changed the name from Tamna to Jeju. In 1271, Jeju became the base of the Sambyeolcho Rebellion against the Mongols. After Sambyeolcho was defeated in 1273, the Mongols placed Jeju under direct rule, using the island (the empire's outpost with the mildest of climate) as a recreation venue for officials and as a place to breed horses. The small Mongolian ponies crossed with the indigenous strain to create a somewhat larger animal well suited for military campaigns; it now dominates the Jeju equestrian population. Jeju became Goryeo territory again in 1367. Jeju was colonized by Japan in 1910, along with the rest of Korea. After Japan's defeat in World War II, Jeju became part of the new Republic of Korea, under South Jeolla. The next year, 1946, Jeju-do became its own province. In a series of events from 1948–1954, known as the Jeju Massacre or the April 3 Uprising, tens of thousands were killed. Responsibility for the incident has long been under dispute but most Jeju people blame it on the Seoul regime, which dispatched a large military contingent to put down a Communist rebellion. The slaughter was an extreme reaction to the killing of a much smaller number of government soldiers who had apparently been committing atrocities. The island divided into two ideologically (left versus right) but also geographically (elevated versus littoral) separate camps, and government troops decimated the population. The isolated Jeju people have long been victims of discrimination. 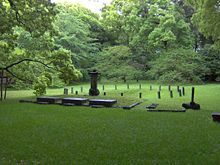 During the 500 years of the Joseon Dynasty, Jejudo was utilized as a destination of exile for figures deemed undesirable by the central government. These scholars, such as Sonsiyeul, Kimjungho, and others brought Confucian teaching and culture to the island. The history of Jeju has until recently been largely omitted from South Korean history books and textbooks. Seogwipo, the island's south port, was one of ten host cities for the 2002 FIFA World Cup Korea/Japan. On July 1, 2006, Jeju-do became Korea's first and (as of 2007) only "special self-governing province." Grass-covered crater on Jeju's extinct volcano. Harabangs, large guardian statues carved from the islands lava. 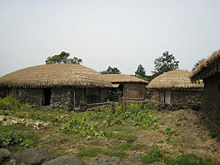 Traditional Jeju houses, with their unique style of thatching, tied down to protect against ocean winds. Jeju is often referred to as a land of three kind of abundance—Seokda (rocks), as Jejudo is located on a volcanic island, with spectacular rock formations, Pungda (wind), because the island frequently has to battle against typhoon winds, as evidenced by the stone walls surrounding the fields, and the distinctive style of roof-thatching, tied down by straw rope, and Yeoda (women), since there have long be more women than men on the island, due to the large number of fishermen lost at sea. At the same time, Jeju is called the land of Sammu or three things lacking—thieves, gates, and beggers. The island's harsh conditions have required its residents to work with diligence, thrift, and interdependence throughout Jejudo's history. Sharing common ancestors added to a feeling of community which made it unnecessary to lock their houses, or to steal or beg. The isolated people of Jeju have developed a culture distinct from that of mainland Korea. Jeju is home to thousands of local legends. The most distinctive cultural artifact is the ubiquitous dol hareubang ("stone grandfather") carved from a block of lava, but locals can frequently be seen wearing traditional brown clothing called garot, naturally dyed with persimmons. Another distinct aspect of Jeju is the matriarchal family structures, found especially on the island Udo, but also present in the rest of the province. The best-known example of this is found among the haenyeo ("sea women"), who are often the heads of families. For centuries they have earned a living from free diving—no SCUBA—even well into the winter, in harvest of abalone, conch, and many other marine products. At present, the only women divers are over 40 and, understandably, the youth take no interest in the job. Some do dive for recreation or to keep the tradition alive, but not to sell their catch. The elder bonafide haenyeo divers either receive province-subsidized prices for their seafood or sell it directly to consumers. Women were long prominent on Jejudo, as so many men left behind widows when their fishing boats did not return. Another contributing factor was that the Joseon government in Seoul levied a heavy tax on men who caught and sold abalone, but not women. The divorce rate in Jeju-do is the highest in Korea, this in a nation whose divorce rate spiked suddenly in the recent two decades of democratization, to become one of the highest in the world. The Jeju GDP was over $8 billion in 2006, with per-capita income of approximately $15,000. Aside from tourism, the Jeju economy is almost entirely agricultural, mostly citrus fruit, but some fishing, but there has been a seeding of tertiary industry including Daum Communications Corp., a leading Korean internet portal and sole owner of Lycos of America. Jeongbang Waterfall, on the Jeju coast. Coastal cave carved in the volcanic rock. Tourism comprises a big and growing part in Jeju's economy. The mild climate, natural scenery, and fantastic seashore make it a popular destination for South Koreans and visitors from around East Asia. Popular with tourists are Cheonjeyeon and Cheonjiyeon Falls and Jeongbang Falls which empties directly into the sea, Mount Halla's easy to scale the summit, Songsan Ilchulbong, a large volcanic cone jutting up from the sea with a perfect-circle smooth concave crater, and the lava tube caves, together with golf, horseback riding, fishing, and modern outdoor leisure sports. Jeju offers the tourist dozens of private-sector and scores of especially beautiful public-maintained natural attractions; it attracts over five million visitors per year about ten percent of whom are from foreign countries. Jeju-do is Korea's most prestigious (but not most-visited) tourist destination province. Though most of the island's electric power needs can be met by gas- and oil-fired generators on Jeju, demand significantly outweighs local supply and Jeju's power grid is connected to the mainland by the HVDC Haenam-Cheju—all run by the Korea Electric Power Corporation (KEPCO). Jeju Island has an excellent highway network, and car rental is a major tourist business. There are no trains. Jeju International Airport dispatches flights to every big Korean city including 60 per day to and from Seoul, and regular international flights to Beijing, Shanghai, Tokyo, Osaka, Nagoya, Fukuoka and Taipei, as well as other seasonal routes. The airport is modern, but the runway is too short to accommodate very large airliners so during the tourist peak seats are in short supply; another international airport is in the planning. Seogwipo Port, as of January 2008, is putting the finishing touches on a cruise ship terminal to tie into the network around Northeast Asia. 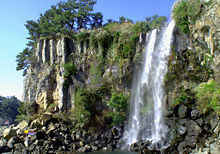 A waterfall in Jeju's island paradise. Until 2005, Jeju Province was divided into two cities (si), Jeju and Seogwipo, and two counties (gun), Bukjeju (North Jeju) and Namjeju (South Jeju) respectively. The two cities were further divided into thirty-one neighborhoods (dong), while the two counties were divided into seven towns (eup) and five districts (myeon). The seven towns and five districts were in turn divided into 551 villages (ri). In 2005, Jeju residents approved by referendum a proposal to merge Bukjeju County into Jeju City, and Namjeju County into Seogwipo City. Effective July 1, 2006, the Seoul government renamed the province, Jeju Special Self-Governing Province with two nominal subdivisions, Jeju and Seogwipo city. In addition to changes in name, the province has been given extensive administrative power that has been reserved for the central government. This is part of plans to create the Jeju Free International City. Jeju's international sister provinces are also islands: Hainan Province (People's Republic of China), Hawaii (U.S.), Sakhalin (Russia), and Bali (Indonesia). ↑ BBC, Unesco names World Heritage sites. Retrieved November 17, 2007. ↑ Georgia Dullea, In Male-dominated Korea, an Island of Sexual Equality. Retrieved November 23, 2007. ↑ Women of China, All-China Women's Federation. Retrieved November 23, 2007. ↑ Korea Times, Cheju Consolidation Vote. Retrieved November 17, 2007. All links retrieved May 2, 2018. Life in Korea pages (a web portal). Jeju Free International City Development Center. This page was last modified on 2 May 2018, at 21:22.